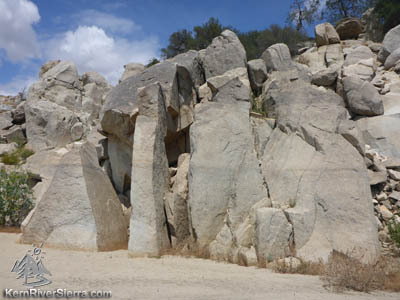 Fun bouldering at the Boulder Gulch Campground on Lake Isabella. French Gulch at low lake levels. Although its not as well known as Boulder Gulch, French Gulch offers some good problems as well. 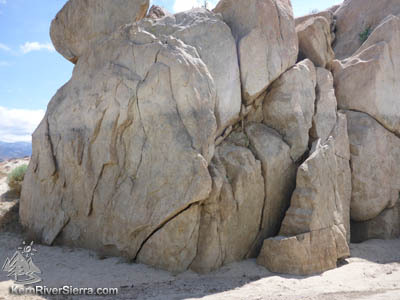 At high water levels, Lake Isabella will completely inundate many of the rocks shown here. If you dont mind getting your climbing shoes wet, it can be a lot of fun in the summer. Otherwise, on lower water years, many of the problems have sand landings. 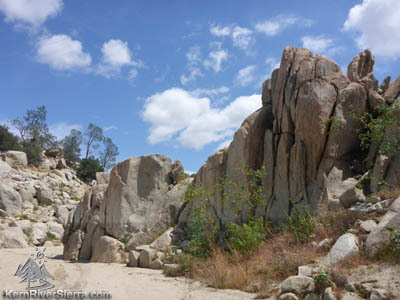 Several good bouldering options exist up the hillside on the west side of the freeway as well. Below the Hwy 155 bridge. 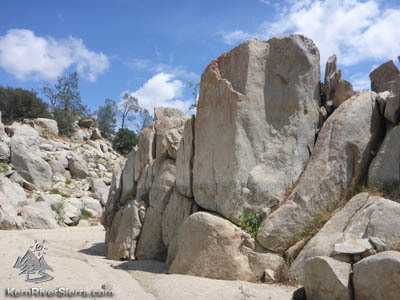 From Kernville, drive south to Wofford Heights and continue on the 155 toward Lake Isabella. After passing Sawmill Road, drive about 2 miles and park on the right just before the French Gulch Bridge (where the road curves left). From the town of Lake Isabella, take Highway 155 around the west side of Lake Isabella. The French Gulch Bridge is less than a mile from the main dam. Parking is on the northwest side. Stairs lead down to the boulders.